Riding a motorcycle in the rain provides the rider with challenges. Challenges that are met via a skill set previously gained, but now with the need to enhance and extend. The single biggest danger faced by any motorcycle rider is the inability to see properly. Rain hitting the visor reduces visibility – the heavier the rain the more reduced visibility. If your visibility is reduced slow down to an appropriate speed. Finger visor wiper blades can be purchased, either as an add-on that fits over your index finger or comes built into the gloves. These are simply a manually operated version similar to wiper blades used on car. Though they are a valuable asset for clearing the visor of water, caution must be taken as using the blades requires removing a hand from the controls. Consider carefully when to use and when full control of the motorcycle is needed. For example traveling in, going round or exiting a bend may not be an appropriate time to use. In very wet and damp conditions, misting of the inside of the visor may occur. Most helmets have air vents built in to help reduce misting, it’s a good idea however to take along a cloth and If misting does occur, pull over in a safe and convenient area to clear the visor. One of the main rules for becoming a safe motorcycle rider is not only to ride for yourself, but to ride for others too. 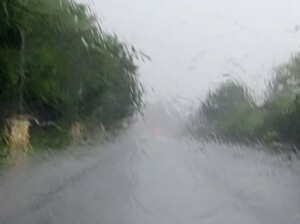 Drivers of other vehicles have reduced visibility during the rain. It’s important to make yourself visible to other road users at all times, especially during low visibility situations such as rain. High visibility, reflective clothing is an affordable and highly effective method for being seen on the roads. This along with your headlight kept on low beam will provide you with as much visibility whilst riding in the rain as possible. Considerable concentration is required whilst riding in the rain. Getting wet, uncomfortable and cold whilst riding can significantly reduce your concentration. Proper, good quality motorcycle clothing isn’t usually cheap, but it will not only keep you warm and dry during the heaviest of downpours, but will provide the best protection possible in the event of an accident. Not all motorcycle riding boots are great in wet weather. You may find that those that don’t perform too well in the wet can easily slip off pedals and potentially leading to hazardous situations. Ensure you choose boots that state they have excellent grip in the wet. Dealing with the rain is one thing, but keeping safe on slippery wet roads is another. Let’s take a look at some tips for safe riding on slippery wet roads.